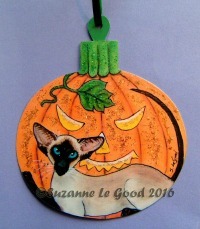 Welcome to October's Meezer Musings as we reach Halloween and head towards Thanksgiving and ever-shorter days. Not for all of us, of course, as our southern hemisphere friends are moving into the summer - but here in the north we're turning to boots, sweaters and cuddling up under blankets! Recently on our Facebook page I posted a collection of AmyLyn Bihrle's pretty, whimsical Siamese cats. It was a popular post and her autumn print below reflects the season perfectly - a harvest basket of fallen leaves and pumpkins and wonderful shades of browns and reds and yellows. The full collection of AmyLyn's Siamese cat prints can be seen here on Etsy. Halloween, of course, is not a good time for any cat to be out on the streets and this month my thoughts have been turning to Siamese rescue centers around the world, and the work they do to provide shelter and find homes for abandoned cats and others who for one reason or another have been made homeless. 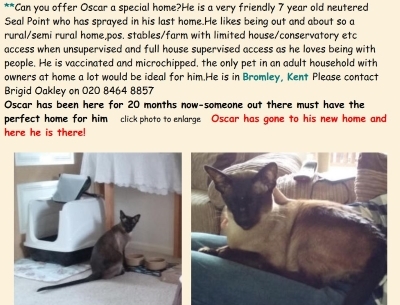 One particular story from UK Siamese Rescue (the Siamese Cat Care Welfare Trust) caught my eye, when Oscar, a cat whose fate I've been following for some time, was recently adopted. Oscar is a handsome seal point not unlike my own Bandit, who came to me from the same rescue. Oscar was clearly a difficult cat to find the perfect home for, as, due to spraying, he was returned by his first adopters. I followed his progress (or rather, the lack of it) because Bandit has also been something of a 'sprayer' over the years - a territorial male who sprays whenever he detects signs of other cats around, so I understood the difficulty of placing Oscar in the right environment and I felt sorry for him as, while he was obviously out of harm's way and safe, comfortable and well-fed, he was confined to the center's cattery, just as Bandit had been, nine years earlier. Bandit was only in the cattery for three months before we adopted him, but poor Oscar was there for a full twenty months. I always very much hoped that he would, in time, find his own 'special home'. Happily a recent note on Oscar's entry shows that he has now been adopted (clearly by some very special people who understand Siamese cats and their ways) and we wish him everything good at the start of his new life in a comfortable home, with a nice lap to sit on! It also seems that (until the next time) Siamese Rescue UK doesn't have any cats currently in their care looking for new homes. Well done to Welfare Officers Brigid and Niki for all their hard work and a special thank you for finding a new home for lovely Oscar. I always try to make sure that the details I have for specialized Siamese rescue centers around the world are kept up to date but things change quickly so they may not always be current. 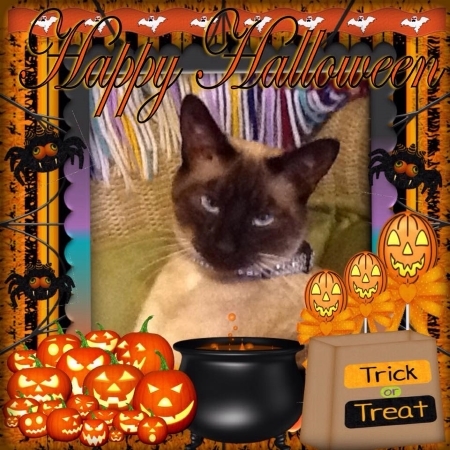 You can find a list of all the Siamese rescues I know about on this page and wherever you are in the world, whether UK, USA, Canada, Australia or somewhere else entirely, I'd love to hear from you if there's a Siamese rescue (or any other pedigree rescue that includes Siamese cats) in your area that isn't on the list. Please drop me a line through our Contact Page if there are any others you think we should know about. Rescue organizations are most often staffed by volunteers and faced with more requests for help than they can handle. They have limits on space, staffing, supplies and finances. Fosters. Many rescues don't have enough facilities to be able to keep all the cats who need shelter - lodging cats in foster care is one way of helping more animals. Transport. As one example of this, the Siamese Cat Rescue Center (USA) runs an extraordinary 'Meezer Express' network of transporters who help to move cats both into care and then out to new homes. While we're on the subject of rescue, I thought you might like to hear about this book, which was recommended by one of our readers, Valerie in Portugal. 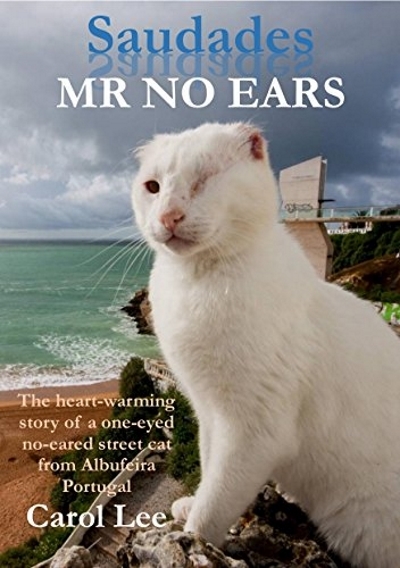 Mr No Ears (link to the book's page on Amazon) is the true story of the leader of a semi-feral cat colony in the Algarve, Portugal. Mr No Ears was nicknamed the Lion King of Albufeira and was, from the book description, "no ordinary cat. Losing an eye and both ears at an early age made him different, but that didn’t stop him! He charmed his way into the hearts of local residents and friends in over fifty countries who followed his daily antics and adventures online". I'll be honest, I haven't finished the book yet (it's patiently waiting in my Kindle!) but everyone who has read it to the end has given it lovely reviews and if you're in any way involved with feral cat colonies or rescue, or just like cat stories, it's a book I'm sure you'd enjoy. Tragically, Mr No Ears died in captivity before his time after being abducted from his colony by kidnappers asking for money. It was a sad end for a much-loved cat with a worldwide following, and Carol Lee's book is an enduring tribute to his memory. Decorated houses, trick-or-treating, excited visitors, noise, masks, costumes, candy corn, pumpkins and spiders galore ... Halloween is all great fun for those taking part! Here in the UK, we have an additional celebration, Guy Fawkes' Night on November 5th with bonfires, fireworks and other festivities. However, what used to be a one-day event has turned into several weeks of firework displays which start towards the end of October and continue well into November. But whether you're celebrating on October 31st, November 5th, or some other time completely - all of it can cause a great deal of extra stress and anxiety for our pets. In keeping with the season, here's Kim Hammad's wonderful boy MuShu, who popped in to our Facebook page to wish Meezers everywhere a very happy Halloween. Thanks to Kim and MuShu for their bright and beautiful greetings card! 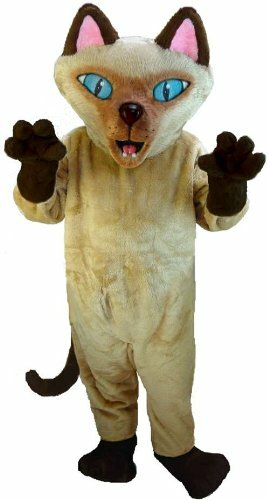 While we're on the subject of Halloween, as a seasonal finale I thought you might enjoy seeing this Siamese cat mascot costume, which came up as a suggestion while I was searching for Halloween costumes and other items. It's amazing what you can buy on Amazon these days. A full-size, professional, Siamese cat costume - it even has a cooling fan inside the head! I don't think many of us will be buying one though - it comes with a hefty price tag and I think it may be a case of - if you have to ask the cost, you can't afford it! Happy Halloween, everyone! Whether you're out trick-or-treating with the kids, staying quietly indoors or any other way you may be celebrating today, keep yourselves and your kitties safe! 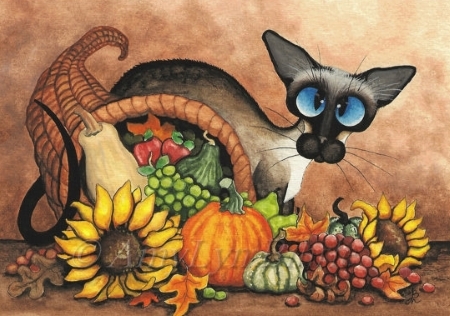 We'll be back with a festive, holiday Meezer Musings towards the end of November.